This maple baked ham is made with a fully cooked ham and a simple maple syrup glaze. The ham is basted with maple syrup. A sauce made with the pan drippings, mustard, and Worcestershire sauce is served with the ham. 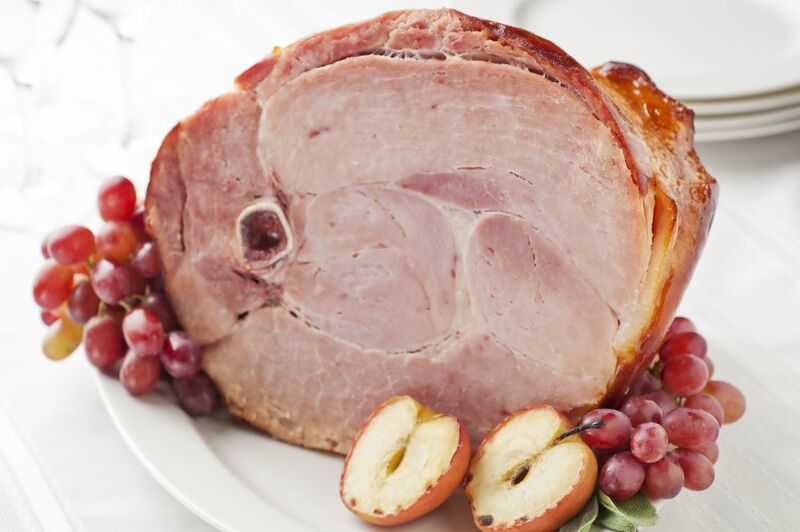 This is an easy and flavorful ham, perfect for any holiday dinner menu. Don't forget the leftovers. Plan to use the ham bone for a bean or pea soup. Use the extra ham sliced or diced in sandwiches, casseroles, or with beans, and enjoy slices in your morning biscuits or with a hearty egg breakfast. Place the ham on a rack in a shallow roasting pan. Pour pan juices into a small saucepan and cool quickly in the freezer until the fat has risen to the top and solidified. Pour the maple syrup over the ham and return it to the oven. Bake 30 minutes longer, basting once with syrup from the bottom of the pan. Remove the saucepan with pan drippings from the freezer. Remove and discard the solid fat on the top of the drippings. Whisk in the flour and prepared mustard until smooth. Whisk in 1 cup of water and Worcestershire sauce. Set aside. Increase the oven temperature to 375 F. Baste the ham with pan drippings. Bake the ham for about 15 minutes longer, or until meat thermometer registers 140 F. Insert the instant-read or meat thermometer in the thickest part of the meat, not touching bone. Remove the ham to a cutting board and let stand 15 minutes before carving. Add the remaining pan drippings to the saucepan. Bring to a boil over medium heat, whisking frequently. Gently boil the sauce for 3 minutes, until thickened and reduced. Transfer sauce to a gravy boat or another small serving dish and serve alongside the carved ham. For a traditional festive look, when you pour the maple syrup over the ham (step 5), arrange pineapple slices over the ham and secure with toothpicks or whole cloves. If desired, place a maraschino cherry in the center of each pineapple ring and secure with toothpicks. Bake for 30 minutes, basting once with the pan drippings. Continue with the recipe from step 6.